Kevin T. Abikoff is partner and co -chairman of Hughes Hubbard & Reed LLP‘s Anti-Corruption & Internal Investigations and the Securities Litigation practice groups. Mr. Abikoff regularly advises clients across myriad industries and geographic regions on the full spectrum of anti-corruption issues. 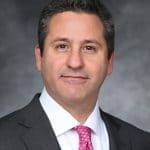 Prior to joining Hughes Hubbard, Mr. Abikoff was the Senior Vice President and General Counsel of Corporate and Compliance for American General Corporation. He is a graduate from Columbia University, School of Law.